Thai Airways is making significant changes to its Royal Orchid Plus frequent flyer program from October 1 2019, affecting how miles are both earned and redeemed on Thai Airways and Star Alliance flights across the globe. On the one hand, business class and first class passengers travelling with Thai Airways stand to earn more miles from the same flights – as do Silver, Gold and Platinum Royal Orchid Plus members – but in turn, the number of miles needed to book a flight or secure an upgrade is increasing dramatically: more than doubled in some cases. Here's an outline of what's changing, and how it affects you, the traveller. 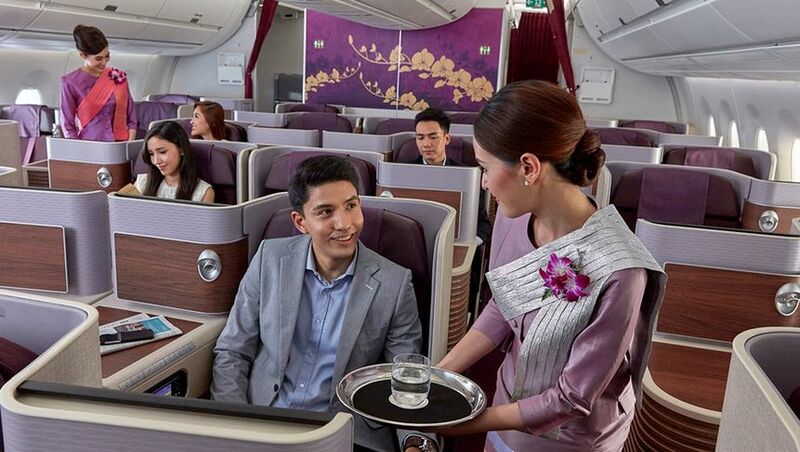 Passengers travelling with Thai Airways on all paid first class fares, some business class tickets and the highest-priced flexible economy fares will earn more miles when they fly from October 1. For example, a non-stop flight from Sydney to Bangkok measures up at 4,679 miles, which today would provide first class travellers booked onto an 'F' fare approximately 7,018 Royal Orchid Plus miles at the 150% rate, being the distance flown (4,679 miles) multiplied by the 150% earning rate. Fast forward to October, and that same one-way journey would instead generate a higher 11,697 miles, when the earning rate climbs from 150% to 250% on the same fares. All other fare types, including J- and Z-class business class tickets, will continue earning miles at the same rate as today. Thai Airways uses 'qualifying miles' to determine which travellers have earned Silver, Gold and Platinum status in Royal Orchid Plus: and as travellers earn 'qualifying miles' at the same rate as spendable miles above, passengers booked on those higher-end fare types will reach the lofty heights of status faster than before. For instance, Royal Orchid Plus Silver status – equivalent to Star Alliance Silver – is awarded after earning 10,000 qualifying miles in a rolling 12-month period, or 15,000 qualifying miles over a rolling 24-month time frame. Using the same example above, that would be achievable with a single first class flight from Sydney to Bangkok, while the airline's Royal Orchid Plus Gold level (Star Alliance Gold) would be unlocked after a single return first class flight from Sydney to London via Bangkok with Thai Airways. Royal Orchid Plus Platinum – a level that provides access to Thai Airways' first class lounge in Bangkok regardless of fare type, complimentary flight upgrades and more – would also be achievable from two return treks between Sydney and London, flying first class (F class) on one trip and business class (C or D class) on the other. It's not that the requirements for reaching Silver, Gold and Platinum status are being lowered, of course: it's simply that the airline's highest-priced fare types will earn more qualifying miles from October, being the Thai equivalent to status credits, which brings these memberships within easier reach of passengers booking those premium fare types. From October 1, Silver, Gold and Platinum Royal Orchid Plus cardholders will earn even more miles on Thai Airways flights, through the introduction of a 'tier status bonus'. Silver members will earn 5% more miles, Gold members get 10% more miles and Platinum travellers will pocket 20% more miles, year-round. This bonus is calculated upon the full overall earning rate from each Thai Airways flight, making it highly rewarding for first and business class flyers, although the extra points awarded via this 'tier bonus' aren't also counted as qualifying miles: merely, extra miles to be spent on flight bookings and upgrades. As an example, a return flight from Sydney to Bangkok clocks in at 9,358 miles flown, which would earn a base-level member 14,037 miles from October 1 when flying on a C or D business class fare, given the 150% earning rate applied to those fares. The tier bonus is then added on top, giving top-tier Platinum members a further 20% boost on that initial haul of 14,037 miles, for an all-out gain of 16,844 miles. Currently, the number of miles needed to book a Thai Airways flight differs, depending on whether you're making a one-way reservation or flying return, with return-trip points bookings presenting the best value, requiring fewer points than booking the journey as two one-way flights. However, that pricing difference is being removed as part of these changes – the cost of a return flight to become twice as many miles as a one-way ticket – with the overall number of miles needed also being amended, for new bookings made from October 1 2019. * On Australian routes, first class only available to/from Sydney. Curiously, Thai's new Royal Orchid Plus reward pricing makes it more attractive to plan a stopover in Bangkok than to merely connect through the airport, booking the Australia-Bangkok and Bangkok-Europe legs on separate tickets. For example, book a return business class trip from Australia to Europe after October 1 and you'd part with 350,000 Royal Orchid Plus miles – but book a return business trip between Australia and Bangkok (130,000 miles), and separately, a return business class trip between Bangkok and Europe (180,000 miles) and you'd pay only 310,000 miles overall: an easy saving of 40,000 miles, by booking your flights across two reservations instead of one. This works best when you're genuinely breaking the journey in Bangkok, and shouldn't be used for tight flight connections when you don't plan to leave the airport, as the airline may not be able to check your bags all the way through, and if the first flight of your journey is delayed, you may not be 'protected' should you miss an onward flight, as would be the case when all flights are on a single ticket. Notably, the number of miles needed to fly solely between Perth and Bangkok also comes into line with the rates from Sydney, Melbourne and Brisbane as part of these changes. Similarly for passengers using Royal Orchid Plus miles to book flights with Thai Airways' Star Alliance partners, the number of miles needed is increasing across the board, with some flights requiring more than twice as many miles to book from October 1 as are needed today. Travellers jetting from Australia to the United States and Canada are hardest-hit, requiring an extra 250,000 miles per return business class trip over and above today's rates, meaning you'll need a staggering 400,000 frequent flyer points to book a single return business class ticket, even on non-stop flights with the likes of Air Canada and United Airlines direct from Australia. Interestingly, the table above also mirrors how many miles will be needed to book Thai Airways international connecting flights from October 1 – 350,000 miles for return business class to Europe, for example – so there's no difference in price whether you choose to fly with Thai Airways or a Star Alliance airline on these tickets, except when flying Thai Airways through Bangkok and breaking the journey, as previously described. Currently, you can fly round-the-world with Thai Airways and its Star Alliance partners for 480,000 Royal Orchid Plus miles in first class; 340,000 miles in business class or 220,000 miles in economy: but come October 1, those rates also jump astronomically. From that date, a round-the-world first class ticket will set you back a whopping 950,000 miles – almost twice as many miles as are needed today – while business class also climbs to 725,000 miles, more than double today's rates. Booking an economy round-the-world ticket is similarly increased to 350,000 miles. To put it another way, with 350,000 Royal Orchid Plus miles in your Thai Airways account today, you could comfortably circle the planet in business class: but make that same booking from October 1 and you'd be stuck back in economy, and paying even more miles for the privilege! Passengers flying Thai Airways from Sydney to Bangkok on the most common J, C and D business class airfares can currently secure a coveted first class upgrade for 52,000 Royal Orchid Plus miles, pending availability: but from October 1, that climbs to 81,000 miles for the same one-way upgrade. On longer legs such as between Bangkok and London, or most other European cities where Thai Airways' first class service is available, that same first upgrade increases from 58,000 miles today to 112,500 miles from October 1, being almost twice as many miles needed to upgrade the same one-way flight. Using Royal Orchid Plus miles to upgrade Star Alliance partner flights will also require more miles from October, with most business-to-first-class upgrades from Asia to Europe bumped from 80,000 to 115,000 miles, such as from Hong Kong to Frankfurt aboard Star Alliance member Lufthansa. Similar increases apply when upgrading from economy and premium economy to business class with Thai Airways, and from economy to business class with Star Alliance partners. For further information about these and other Royal Orchid Plus changes, visit the Thai Airways website. With the redemption rates so high, I wonder if anyone would be interested in doing so, Inspite of the earn rates being higher. For me at least, I’d think “is it worth spending that many number of points/miles on a ticket”. I’d rather fly with other airlines which don’t need this many number of points. To me, it seems like this is a move done to make Thai airways look exclusive in regards to the earn rates or difficult to achieve or something like that in regards to redemption rates. Comment on "Thai Airways revamps Royal Orchid Plus frequent flyer program"